During his 16-year tenure at the helm of Louis Vuitton, Marc Jacobs tended to experiment with prints in a few specific ways; either he went for straightforward takes on the brand's iconic monogram and Damier patterns, or he brought in an art world titan to shake up the monogram for a limited edition capsule collection. Nicolas Ghesquiere, on the other hand, has shown quite a penchant for seasonal prints that have a vaguer link to Vuitton traditions, and the latest is Spring 2016's Chain Flower print. The print takes the floral motifs from LV's signature monograms and transforms them into links on a chain that's rendered big and bold across contrasting Epi leather, reminiscent of the prints popular on silk scarves in the 80s. Chain Flower does a nice job of walking the line between brand conventions and something completely new, and those tired of logo-covered Vuitton bags will be happy to note it completely eschews the letters L and V.
Check out the first bags available in the print below. And we thought that the Alma Chain Flower print was a gem, but that all changed after we meet the Alma Flower Bag. This Blooming Bag tells a romantic story of the House’s savoir-faire. Individually cut and coloured leather blossoms are set with metal rivets on glamorous Monogram Vernis patent calf. 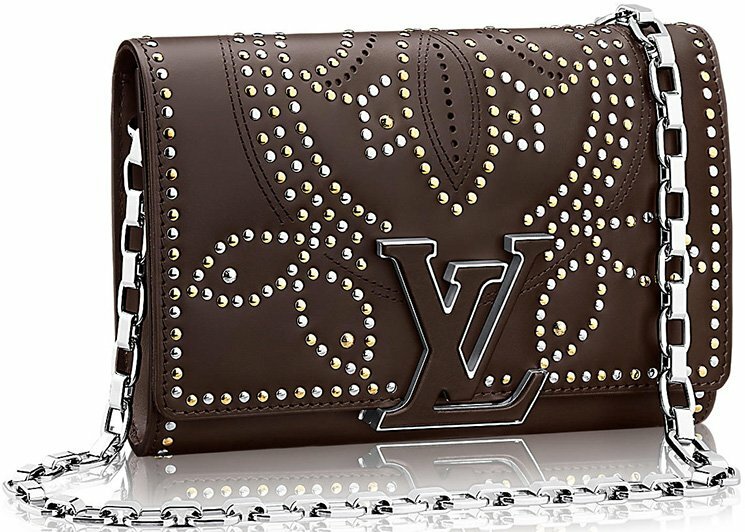 Look at it, the Louis Vuitton Alma Flower Bag shines like a star, its made to be your number #1 BFF. With its help, every night will be yours – steal it naturally. The bag comes is also made with gold metal pieces, the top opens and closes with double zip closure. To refine the design, it comes with a padlock and key bell. The interior is made with one large compartment as well as a smartphone pocket. Measuring 9.4′ x 6.7′ x 4.7′ inches (L x H x W), priced at $2230 USD, €1620 euro, £1510 GBP, $18500 HKD, $2800 AUD, ¥262440 JPY via Louis Vuitton boutiques. If you think that the iconic Lady Dior bag couldn’t get any better, think again. This Lady Dior Flower Bag is just too beautiful that words aren’t enough to give it justice. Yes, it’s that eye catching. Definitely worth our stares, time and attention, the Lady Dior Flower Bags exude the right amount of flower power. Feminine yet still sophisticated in all the right places, the added spring/summer flowers are a breath of fresh air. Take this flower bag for instance. The pink flowers added life and ultra feminine touches to this black Lady Dior bag. We won’t be surprised if the fashion world will be taken by floral patterns soon but hopefully they won’t overdo it. Made up of silver-tone jewelry, the added D,I,O,R bag charms made it all the more gorgeous and ravishing. As if that’s not enough, it also has a chained shoulder strap for cross body or shoulder wearing. If there is an award for the finest fiery red flowery signature bag, then without a doubt and without blinking our eyes, we will definitely hand out the award to Valentino for its Mini Lock Flower Bag. The flower power game is strong with this Valentino bag. We are loving the meticulous manner of which the leather beaded flower patches were placed side by side. The added golden studs and golden metal chains on the other hand created a perfect balance so that the bag might not look too overpowering with its floral design. The red color is also another reason to fall in love with this bag. A bold and classy fashion statement, this Mini Lock Flower Bag is the perfect go-to bag for romantic dinners. Pair it with your clean and crisp white dress and you’ll absolutely look divine. It measures 12’ x 17’ x 6 (H x W x D) cm. As warmer months continue to draw near, I cannot help but think about all of the pretty things I will be pulling out of winter storage. Let’s face it, spring and summer are a time for bright colors and bold prints. So why not make the most of it? When you have designers like House of Holland famed for their in-your-face prints, jumping on the bright and bold bandwagon is simple. And with styles such as the House of Holland Hot Dog Flower Bag, why wouldn’t you want to? When I first saw the House of Holland Hot Dog Flower Bag, I couldn’t get over how surreal it appears. What I mean is, the flowers practically jump out at you. Their 3-D sculpted look, combined with intricately embroidered details, make this flowered bag like nothing I have ever seen before. Each flower features a faceted gold-tone center. Well, except for the PVC flowers you see here and there. Those have jeweled centers! The flowers continue all the way up the strap too! This piece is definitely testing the boundary between fun and over-the-top. But, in a way, I think that is the point. The colors are definitely an unusual combination though, so perhaps this piece should be paired with a solid complimenting or neutral color.